Melbourne Heart FC has announced its rebrand to Melbourne City FC and unveiled a new badge and sponsorships. The renaming is a step towards a global empire of ‘City’ clubs by the City Football Group (CFG), a holding company of the Abu Dhabi United Group. Since acquiring Heart earlier this year for $12 million, CFG now owns Melbourne City FC, English top-flight club Manchester City FC, and upcoming US club New York City FC. Melbourne City FC also unveiled a new club badge inspired by the heritage of Melbourne, as well as kit designs for the upcoming season. Hostplus, an existing partner, will now be the Club’s new back-of-shirt sponsor, and Nike will supply its kits. 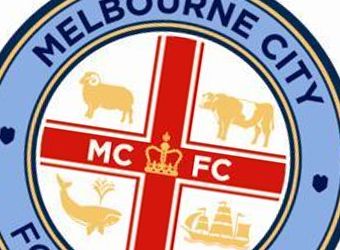 Melbourne City FC says its new badge, below, draws inspiration from the heritage of Melbourne while celebrating modern day aspects of the Victorian economy, society and environment. The central red and white component of the badge ensures that the Club’s foundation colours will always be an integral part of its identity. The new home kit for Melbourne City FC combines the white from the Club’s previous kit designs with the signature blue of its sister clubs in Manchester and New York. The new away kit for Melbourne City FC celebrates the Club’s history, the wishes of its existing fan base and the red and white that remains at the heart of its identity. The home and away kits for Melbourne City FC have been designed by Nike, which has been announced as the Club’s official on-field kit supplier. There has been some controversy around a move to fully sky blue kits, like Manchester City FC, as Sydney FC already wear the colour. One of the most immediate benefits of belonging to the international group is that the Melbourne team will enjoy the addition of Spain’s all-time leading goal-scorer David Villa for a ten-game loan from New York City FC. A player of Villa’s calibre should dramatically boost the profile of the A-League in Australia’s sporting consciousness, as well as ticket and merchandise sales.